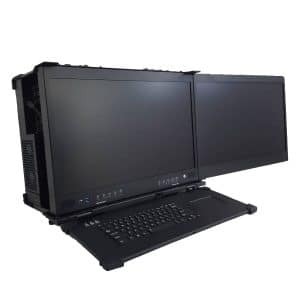 When you need a whole lot of computing capability, and plenty of screen real-estate, it’s important that the transportable workstation you choose will always work when you arrive on site. 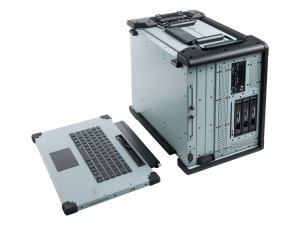 The MegaPAC-S2 is a modern, robust, professional workstation ready for deployment. If you need an i7/i9 system or a Dual Xeon system with liquid cooling – MegaPAC can support you. Adjustable hinges for the second display. Two additional 3.5″ bays are available for the O/S or O/S + additional data. There is room for high powered RAID controllers or data compression cards as well as connectivity to NAS etc. Depending on the motherboard selected, the MegaPAC-S2 can support dual-card graphics solutions from AMD and Nvidia. Dual Xeons and dual graphics cards require significant cooling. Temperature sensitive fans keep the system components cool while minimizing the acoustic impact on the user. AMD Pro SSG cards are available with in-excess of 2TB of graphics card memory for those professionals working on 8K content. Memory is not the headline spec on Nvidia’s Quadro 8000 However, with 130.5 TFLOPS per card, and Nvidia NVLink allowing two cards per system, there’s a lot of graphics power possible. Eight Lan ports – 2 Fiber SPF+ 10G, 2 RJ45 10G, 4 RJ45 Gigabit. 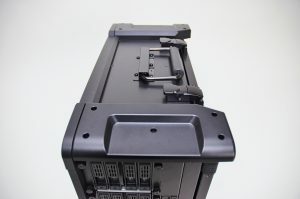 There are eight LAN ports and an IPMI port on the rear panel! Two 10G SPF+ ports (fiber), two 10G RJ45’s, four 1Gig RJ45’s. There’s also an IPMI port for remote management of the system. All ports are protected behind a hinged door for protection during transport. 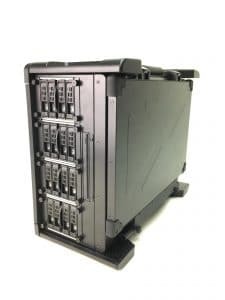 The fiber ports allow for the attachment of a local or remote NAS device to greatly expand the storage capacity for enterprise and tactical mission systems. 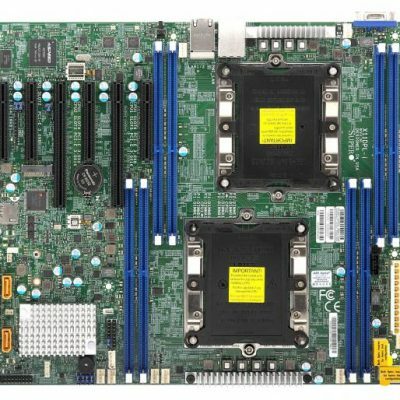 The heart of the system is an Intel 12 Core Xeon Processor with up to 512GB RAM. TheIntel D-2166NT has 12 cores and 24 threads running at up to 3GHz, with 17MB of cache. Three HD displays fold neatly for transport. 5760 x 1080 scene space. 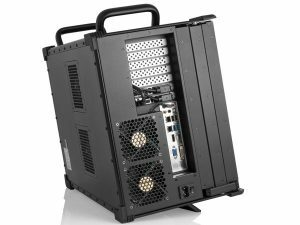 An optional Nvidia Quadro P4000 professional graphics card means there is plenty of power to drive the three displays with full motion video, 3D visualization or geospatial imagery. The second slot can be fitted with a video capture card for real-time capture and analysis of drone video etc. Available with four removable SSDs to give 30TB of removable storage, the NotePAC is a powerful portable server-grade three screen laptop. Dual Xeon, liquid cooled. 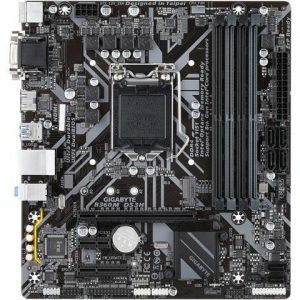 Server grade motherboard. Nvidia graphics. Removable HDD and SSD options. The MilPAC-III is certified to MIL-STD-810G, Method 514.5, Figure 514.5C-5 Loose cargo test setup, 0- 50 degrees C.
Proudly manufactured in Azusa CA. The MilPAC-III has been continuously deployed by the US military since 2015. Continuous refinements to the design have been incorporated to increase performance and extend reliability. A new display backlight option is now available. A very bright display can still be difficult to read outdoors because it is very difficult to compete with the Sun! 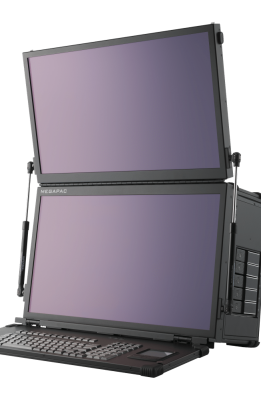 To improve usability, the MilPAC-III sunlight readable displays may be adjusted to a host of different opening positions, and the tilt of the whole unit changed using the robust foot. The new displays’ contrast ratio exceeds 400:1 while providing deep blacks and extremely bright and readable detail. The 1000 cd/m^2 displays were tested for maximum brightness using a Topcon BM-9 luminance meter. Measured maximum white luminance was 1053 nits. MilPAC-III is in continuous use in-theatre. The video feed from drones is fed to the CIC for analysis. Compressed video may then be sent to command for subsequent evaluation. Video feeds can be mirrored through HDMI ports on top of the unit to allow the operator to share engagement data with the commanding officer. The MilPAC can be configured with extra I/O ports, including, but not limited to, multiple Gigabit Ethernet or fiber ports. 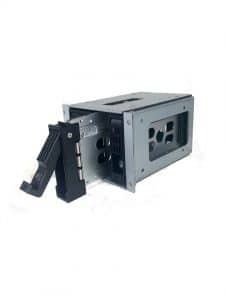 Five removable drives as standard including three 3.5″ HDD’s. The MegaPAC-L3 is the latest iteration of the hugely successful MegaPAC family. Available now with three 24″ displays* in either HD or 4K resolution, the MegaPAC supports EATX motherboards with the latest Intel processors. Available with Dual RTX2080Ti’s and Dual Intel Xeon Platinum processors, the MegaPAC is the most powerful portable on the planet. With support for 1TB of DDR4 RAM and 150TB of SSD storage, the MegaPAC-L3 is up to almost any task. The MegaPAC series has a full-sized 105-key keyboard with integrated touch-pad. The keyboard is available in a variety of languages. Power: 850W 100/240VAC, 50/60HZ auto-switching 80 PLUS GOLD rated power supply. Up to seven PCIe expansion slots. 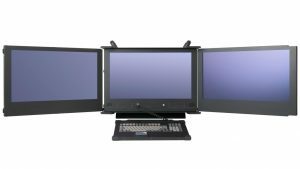 *There are four versions of the MegaPAC chassis offering single screen, dual screen over and under, dual screen side-by-side, and triple screen configurations. All are offered with a choice of i5, i7, i9, and Xeon processors. Now available with more than 120TB of removable SSD storage, the NetPAC-RHD16 is the most powerful portable server on the planet. The brief? Make the most powerful portable computer on the planet. Oh – and all the drives must be removable. Must be capable of copying a high speed network in real time. 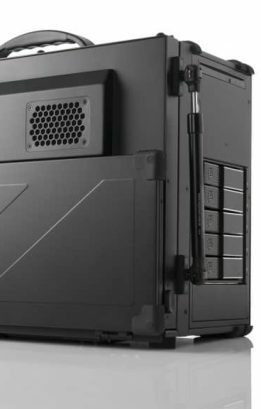 Can you make it so it fits in between 19″ rack rails? 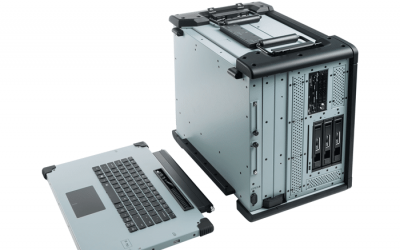 There has never been a portable server like the NetPAC-RHD-16. Dual Xeon processors. 1TB RAM. 120TB+ of removable, high speed, high reliability SSD drives. Separate removable system drive. Robust aluminum construction and attention to detail ensure that the NetPAC-RHD16 just works when you get to the work-site. 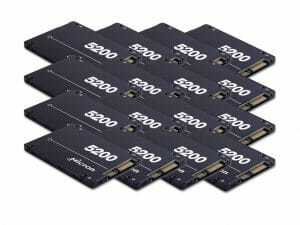 Micron 5200 series SSDs are robust and reliable. 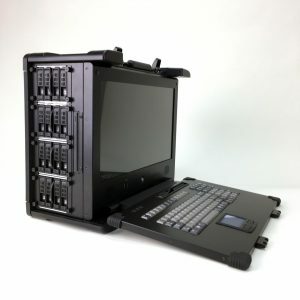 Maybe you don’t need the most powerful portable computer ever built? 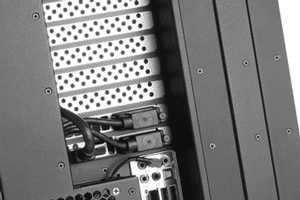 We can build the NetPAC-RHD16 with significantly less costly components, tailored to meet your real-world requirements. There are still portable computers with expansion slots available. 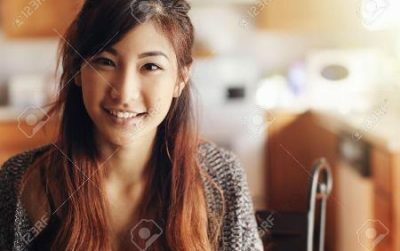 They are a niche product for users that need to connect to systems in the real world. 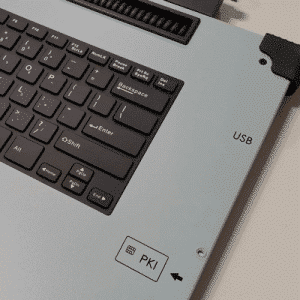 Light-weight laptops with USB-C have a reasonable amount of processing power, and lots of bandwidth in the USB-C ports… but they are significantly more difficult to configure as test and measurement equipment than a rugged portable with PCIe expansion slots. (Legacy configurations supporting older buses like PCI are still available as special configurations). 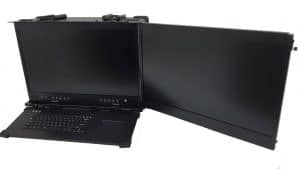 Modern multi-slot portable computers typically have one or more flat panels, from 15″ up to triple 24″ display systems. Processors range from Intel i5 to Dual Xeon server systems, and the storage is provided by anything from a single M2 card up to a 16 drive RAID array. SSD’s are the norm now, but there are still high capacity HDD’s which have their uses when absolute storage size is more important than ruggedness. HDD’s are also still cheaper per Terra-byte. A single SSD is now readily available with 7.6TB per drive. The heart of a rugged portable “lunchbox”-style PC is the motherboard. 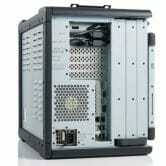 Systems are available that support ATX, micro-ATX, e-ATX, and mini-ATX. 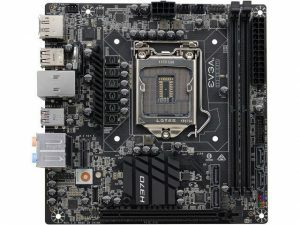 According to requirements, ATX, Micro-ITX, Mini-ATX, ATX, and EATX boards can be supported. Alternatively, a passive backplane can be used with a plug-in computer card (PIC). PIC cards are designed for industrial use and have extended temperature ranges. 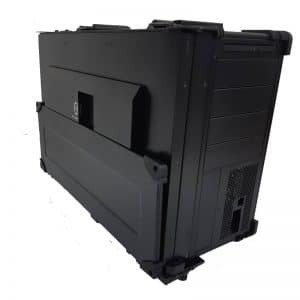 They can be used to make massively expandable systems with lots of slots or used to create small form factor systems that support just enough expansion. 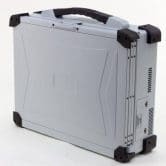 Portable computers with expansion slots are generally only sold fully configured – you can’t just buy the case. 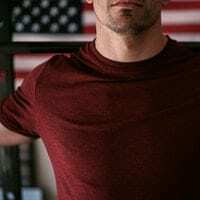 It’s simple economics; the manufacturer can’t make a living with the limited quantity sold. 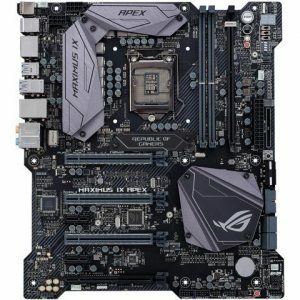 Different motherboards will have support for different processors, supporting multiple slot type and numbers of PCIe lanes. Cooling is an important requirement for high-performance computing. Overclockers looking to extract maximum performance from a chip will go to extraordinary lengths to cool the processor using liquid nitrogen or massive external refrigeration units. 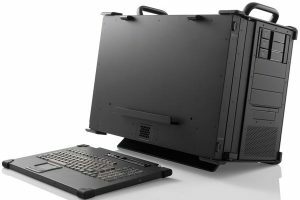 In a rugged portable, it’s usually just a case of optimizing air-flow and making sure the hot components aren’t blocked. Tidy cable management helps smooth the airflow which helps cooling and the audio profile. All of the work that was done on keeping Hard Drives cool is not wasted as it applies nearly as much to SSDs. SSDs generate a significant amount of heat when used – especially when writing. Military applications almost always require removable hard drives for both data and the operating system. 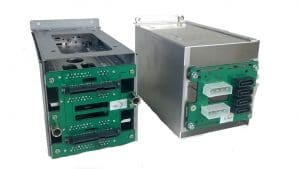 These can be individual drives or removable caddies that reduce the risks of mixing up the drives in a RAID array – which can be a costly time sink to fix, if not worse. Expansion cards range from top of the line graphics cards to multi-I/O serial cards. Connections via 1553, 1394B (as used on the Lockheed Martin F-35), CAN bus, Infiniband, HyperSCSI, NAS, SAN, and many others are possible with adaptors from multiple manufacturers. 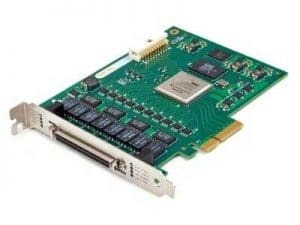 Abaco Systems RPCIE-1553 is the latest generation of performance and flexibility for MIL-STD-1553 A/B Notice II on a native PCI Express module. Available in -40°C to +70°C temperature with one, two or four dual-redundant channels, the RPCIE-1553 includes advanced API (Application Programming Interface) software that reduces application development time. The FireSpy850, FireSpy450b, and FireSpy450bT bus analyzers complete the second generation of 1394 analyzers offered by DapTechnology. Based on the industry-leading FireSpy800, the all new and enhanced architecture of the FireSpy810, as well as the form factor advantages introduced with the FireSpy3850, make these PCI form factor analyzer cards the most compelling package for card-based 1394 analysis solutions found in the industry. ConnectX delivers low-latency and high-bandwidth for performance-driven server and storage clustering applications. 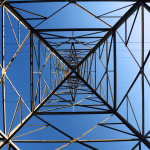 These applications will benefit from the reliable transport connections and advanced multicast support offered by ConnectX. 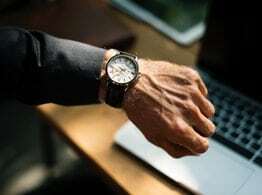 No CPU intervention is required when Network protocol processing and data movement overhead (such as InfiniBand RDMA and Send/Receive semantics) are completed in the adapter. Servers supporting PCI Express 2.0 with 5GT/s will be able to take advantage of 40Gb/s InfiniBand, balancing the I/O requirement of these high-end servers. 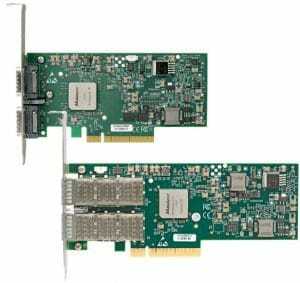 QM2 series PCIe cards add support for M.2 SSDs and 10GbE RJ45 connectivity to a QNAP NAS. Combining M.2 SSD and 10GbE connectivity into one solution, the QM2 helps improve overall NAS performance while providing an affordable upgrade path for adopting 10GbE networks. 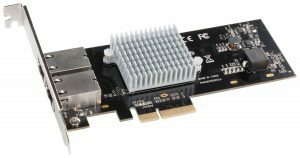 Sonnet’s Presto™ 10GbE 10GBASE-T PCIe 3.0 card is a powerfully simple and cost-effective way to add dual-port copper 10GbE connectivity to your Mac Pro® tower or Windows® PC, or Linux® server. 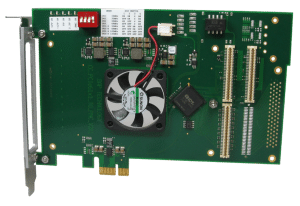 The CaptureXG 1000 card comes standard with essential features, such as accurate time synchronization and stamping (IRIG-A, B, and G), programmable 5-tuple filters, PCAP Next Generation file format, and a highly efficient PCI Express Gen 3 host interface. 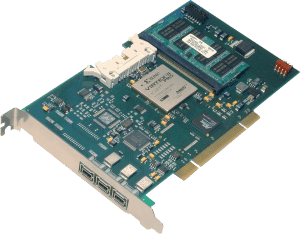 The CaptureXG 1000 card is fully integrated with the popular Wireshark network protocol analyzer, so it provides a powerful tool for IT managers to easily leverage their teams’ existing expertise, which increases efficiency in diagnosing network issues. There is no getting away from the fact that this is a big portable. It’s the biggest screen portable! It’s also the most powerful portable on the planet. 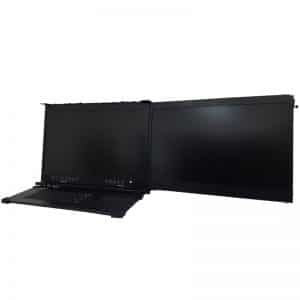 Three 24″ 2K or 4K displays and a full-sized motherboard which allows for up to dual Xeon processors. Touch screen displays which are available in 2K and ultra-high resolution 4K displays. 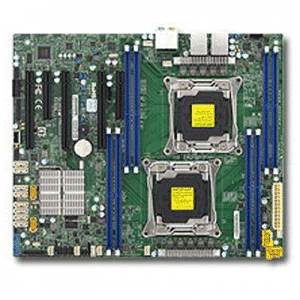 Extended ATX motherboards mean the choice of Intel i7 or Dual Xeon processors. There is plenty of space for the largest and most powerful graphics cards – for CUDA use or to drive the three 4K displays. 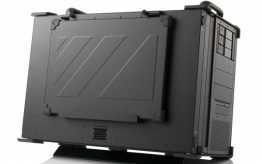 A wheeled transit case is supplied as standard, and fully deployable shipping cases are also available. Tilting feet improve the ergonomics of operation for the use, and a full sized keyboard makes this a comfortable transportable workstation. 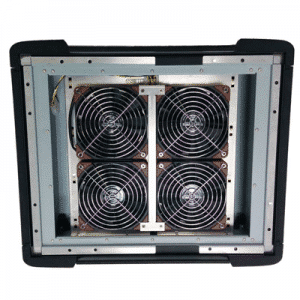 Up to dual Xeon processors using forced air cooling and thermostatically controlled fan systems. The detachable keyboard attaches to the front of the system when the displays are closed for transit. 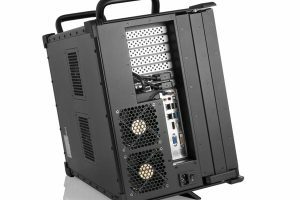 Multiple slots with an EATX motherboard allow for highly flexible configurations. 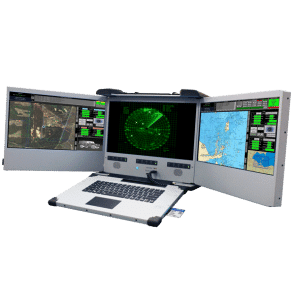 Dual Xeon workstation with video inputs and screen mirroring in daily use worldwide by the US Navy. 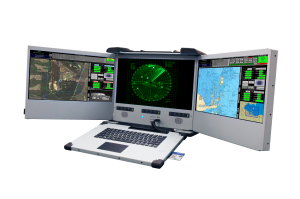 The MilPAC-III is perfect for GeoINT, UAV integration, Video optimization and compression. Mil-Spec tested for shock, vibration, EMI, RFI, transport and Mil-Std 901D for torpedo strike. Now available with a high capacity filtration system. MilPAC-III – powerful, robust and very high performance.